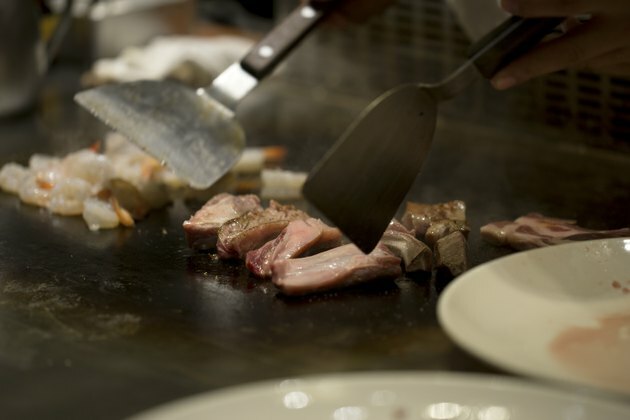 Hibachi is a style of cooking that originated in China, although it is more commonly associated with Japanese cooking. The hibachi is a small bowl-shaped portable heater with a grille on top. Hibachi chicken is chicken breast that has been marinated in seasonings including soy sauce, ginger, garlic, green onions and sugar, and cooked quickly on the hibachi grill. Hibachi chicken is a good source of protein, but depending on the chef and recipe, it can be high in fat and sodium. Hibachi chicken makes a low-energy dense meat choice, meaning it has a low calorie content compared to its serving size. On average, a 4 ounce portion of hibachi chicken contains 160 calories, or about 40 calories per ounce. The fat content in hibachi chicken can vary depending on how it is prepared. The amount of fat in a 4 ounce portion ranges from 4 grams to 11 grams of total fat, 0 grams to 4 grams of saturated fat and 70 to 80 milligrams of cholesterol. Fat in food is necessary for good health. However, most of your fat choices should be low in saturated fat and cholesterol. Saturated fat and cholesterol are the unhealthy fats that raise blood cholesterol levels, and you should limit your intake of saturated fat to less than 10 percent of calories, and cholesterol to less than 300 milligrams a day. Hibachi chicken is low in carbohydrates and high in protein. A 4 ounce serving contains 20 to 22 grams of protein and 1 to 2 grams of carbohydrates. One serving of the hibachi chicken meets 42 percent of your daily value for protein. The percentage of daily value was designed by the Food and Drug Administration as a tool to help you select healthy foods, and is based on a 2,000 calorie diet for healthy adults. Hibachi chicken is usually marinated in soy sauce, a very high-sodium Asian condiment, which can significantly affect the sodium content of the chicken. The amount of sodium in a 4 ounce portion of hibachi chicken ranges from 126 to 747 milligrams. The U.S. Department of Agriculture reports that the higher your daily sodium intake, the higher your blood pressure. High blood pressure increases your risk of congestive heart failure and kidney disease. Limiting your daily intake of sodium to 1,500 to 2,300 milligrams a day can help you keep your blood pressure under control.